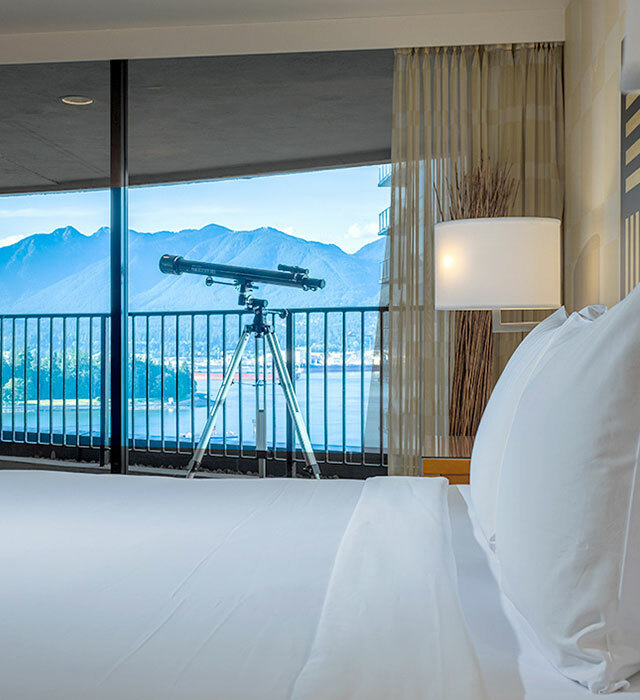 View All Rooms Experience breathtaking Coal Harbour and North Shore mountain views in our Harbour Rooms, or the stunning Vancouver skyline from our Cityrooms. View Our Amenities Our hotel offers countless amenities to make your home away from home as comfortable as possible. Free WiFi, bikes and more! View Our Location Just minutes from Vancouver Convention Centre and steps to the seawall. A Downtown Vancouver waterfront location—right where you want to be. We offer a number of amenities to make your home away from home as comfortable, convenient and memorable as possible. "Very Nice Location and Hotel"
Offering complimentary high speed WiFi, and onsite fitness training, The Pinnacle Hotel Harbourfront experience is a refreshing alternative to the typical hotel routine. Explore this amazing city with us: book your Pinnacle experience today. Treat yourself to a special kind of downtown Vancouver Hotel experience, one that puts you just steps from the action and offers great value for an authentic experience of this amazing city. Whether you’re visiting Vancouver for a big vacation, or spending just one night in the city for a concert or special event, Pinnacle’s exclusive packages and promotions help take the stress and expense out of your travel plans. We look forward to making your Vancouver experience unforgettable. Located just steps from the best of downtown Vancouver with stunning views and first-class cuisine, Pinnacle Hotel Harbourfront has it all. Experience the Pinnacle difference of making every guest experience special with personalized service, thoughtful extras and unwavering attention to detail Offering complimentary high speed WiFi, and onsite fitness training, The Pinnacle Hotel Harbourfront experience is a refreshing alternative to the typical hotel routine. Explore this amazing city with us: book your Pinnacle experience today. View Menu Experience breathtaking views of the harbour and North Shore mountains while you relax in comfort and style in any of our Harbour rooms. Learn More Our hotel offers countless amenities to make your home away from home as comfortable as possible. Free WiFi, bikes and more! Learn More Just blocks from the seawall, our hotel is located on the waterfront in Downtown Vancouver--right where you want to be.